The aim of Dementia Awareness Week is to raise awareness of dementia and related issues. However there is a presupposition embedded in this that we are the ones with awareness. I am questioning this. What about awareness in people with dementia? What might their capacity for awareness be? What might they be aware of? Alzheimer’s is the most common type of dementia accounting for 60% to 80% of all dementia cases. In the early stages people struggle to maintain control in their lives, but as the disease progresses and more brain cells die off, they loose their sense of self and their sense of linear time – past and future roll into the present. When this happens they have no choice but to give up and totally surrender to their condition. Those involved in their care often give up too, believing they have ‘lost’ the person they knew. In this late stage of Alzheimer’s people have intermittent altered states of consciousness in which there are spaces of no thought. This is something that people without Alzheimer’s also experience when they are in deep meditation and describe, when in this state, having a sense of expanded consciousness and awareness. So what are people with Alzheimer’s experiencing when they are in this state? When my mother had Alzheimer’s she said many things that demonstrated she was experiencing expanded consciousness. ‘Television (her portal to expanded consciousness) is amazing. 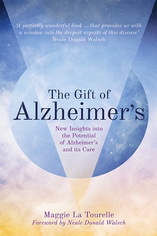 I can go there and ask all my questions.’ What she told me, and my hypothesis about what is happening in Alzheimer’s, are in my book, The Gift of Alzheimer’s. I ague that the empty mind experienced in Alzheimer’s is far from being a loss. It is a gift and can actually give rise to greater awareness and consciousness. I was talking on a US radio show last week about this when a man named Harry who has Alzheimer’s, called in to the show. He said, ‘People keep trying to pull us back into their world. They don’t realise we are vey happy where we are.’ He was over joyed that I had acknowledged and validated what he was experiencing and pleaded that people should listen to him and me. Returning to my question, ‘who is the most aware of us all?’, we are both aware but in different ways. Our brains are active all the time and we are constantly doing, except when we are engaged in some deep meditative practice. In contrast the brains of people with Alzheimer’s, as a result of damage, become inactive and this involuntary emptiness means they naturally experience a state of being and even bliss. So what can people with Alzheimer’s teach us about awareness? We can continue to use our brains to learn, be useful and do the things that need to be done and we can also choose to join people with Alzheimer’s in their world and learn from them. They can teach us things that would be of benefit to us: how to stop, become present, empty our minds and experience expanded consciousness and awareness. We can become even more aware and have the best of both worlds. Looking forward to you joining me on the next stage of our journey together. “We’re learning we’re immortal. You must tell others.” This was my mother Pat’s message to me and, as instructed, I am passing it on to you. She wasn’t a preacher, she actually said this when she had late-stage Alzheimer’s and had few functioning brain cells left. Following on from this declaration she told me, with a voice of absolute authority, “Death is nothing to be afraid of”. What a wonderful message! If we all knew this, and I mean really knew this, our lives would be so different. We would be free from the ultimate fear, the fear of death, and would able to live our lives more fully right now. So what stops us? I imagine many of you will, like me, have believed in life after death but had moments of doubt. What do we need to know in order to not just believe, but to know that we are immortal? Let’s start with my mother. How did she come to know she was immortal? She hadn’t been particularly religious and had had her fair share of troubles in life. What did she do? Well her realization came to her not through anything she did but rather through what she didn’t do. As past and future rolled into the present, the Now, and her sense of self, her ego, diminished, as happens in late-stage Alzheimer’s, it became easier for her just to ‘be’. ‘Being’ is a transcendental state and in this state amazing things can happen. Taking a more rational view you wouldn’t be blamed for asking, “Was this merely the delusion of a woman with Alzheimer’s?” After all, most people assume that the wanderings of the Alzheimer’s mind are delusional. And did I become deluded too? Did we both want to believe in immortality and as a consequence, create it? Something remarkable happened that convinced me that what I was hearing was the truth. My mother became very psychic, something she had not been before. Over a period of three and a half years on at least eight occasions she read my mind and told me things about myself that I hadn’t told her and of which she had no obvious way of knowing. The information that she gave me, to my amazement, was one hundred per cent correct. That convinced me that she had developed the ability to tap into some other level of consciousness, possibly the Universal Information Field, and access information from there. I knew the personal information she was giving me was accurate so how could I be selective and not accept the other information. After all, what she was saying about immortality is what mystics and religious teachers have been saying throughout the ages. Further more, my mother had Alzheimer’s and couldn’t remember much, so it seemed to me that this information was coming to her directly from a source of wisdom on a non-physical level. Moving from believing to knowing has had a profound effect on me and changed how I experience life. Knowing could change your life too. Don’t think about it, ‘be’ it, know it, Now! In the film, Still Alice, the gift of Alzheimer’s comes at the very end, when Alice’s daughter asks her mum, ‘What was it about?’ and Alice replies, ‘Love’. For me this is the most beautiful moment in the film and tears streamed down my face as I watched it. But although this was the end of the film, it was not the end of Alice’s Alzheimer’s journey – far from it. T. S. Eliot in his Four Quartets said, ‘The end is where we start from,’ and the insights I’ve gained about Alzheimer’s over the years have shown me that the film’s ending is actually the beginning of a new stage – the end-stage. It might surprise you to learn that there is unexpected potential to be found in this final phase and truly wonderful and mysterious things can happen. Julianne Moore’s Oscar-winning performance in Still Alice deserves all the accolades it has received. She portrays with great empathy and accuracy the slow, painful process of disintegration from Alice’s diagnosis of early onset Alzheimer’s through to when Alice seems to be out of this world and can barely speak. But where is Alice towards the end? And what does she want to convey? It is not surprising to me that her last word is, ‘Love’. Researchers in the field of neuroscience have found that people with Alzheimer’s have a propensity to be loving, especially when they are in the presence of others who are feeling love towards them. Although this is not always the case in the early stages when people are still trying desperately to exercise control, it happens later when they have lost much of their cognitive function and have no choice but to surrender to their condition. Around this time they start to lose their sense of self and their ego diminishes. They also lose their sense of linear time – past and future move into the present. This all sounds horrendous to us but according to Eckhart Tolle, author of The Power of Now, being without an ego and totally present in the ‘now’ is a transcendental state. So viewed from this perspective the process of Alzheimer’s is not only one of dissolution, but also, more importantly, one of transcendence. But, you might ask, transcendence to where? Spiritual and religious teachings say that love is the gateway between this world and the Other World. Still Alice ends at this gateway between these two worlds. So what is beyond? When people move into the late-stage of the disease they experience intermittent altered states of consciousness in which they perceive a world beyond our physical realm. They can surprise us with moments of great clarity despite having few functioning brain cells. And at times they can demonstrate extra-sensory-perception (ESP), such as clairvoyance and clairaudience. When they are in the Other World they feel deep love, are free from pain and have no fear of death. So what do we need to know in order for us to help our loved ones with Alzheimer’s make the transition from our physical world, with all its trials and tribulations, to the Other World where they can enjoy freedom and ultimate bliss? It goes without saying that providing wellbeing is a core condition, but that is not all. We need to be curious and listen for the wisdom buried in seeming incoherence. We need to seek meaning in their communications. We need to validate their experiences even if they don’t match our own – they are real for them. In other words, we need to be flexible and move onto their map and explore it with them. And above all we need to do this with a loving presence. When we do these things we can help our loved ones make a peaceful transition that will prepare them for a good ending – and a wonderful beginning. I would like to see a sequel to the film, Still Alice, which focuses on the Other World. ‘It’s difficult working between two worlds,’ my mother said when she had late-stage Alzheimer’s. Following this interesting statement I proceeded to record our conversations for the next three and a half years and this chronicle forms the heart of my book, The Gift of Alzheimer’s. Through the lens of these conversations and my insights as a psychotherapist and energy therapist, the mysteries and extraordinary gifts of the final stage of the disease could be told to the world. Looking forward to you joining me again on the next stage of our journey. “I can ask all my questions… go there and get anything I want.” Mum. Familiar? Yes! But can you do this without the use of an electronic device? My mother could when she had late-stage Alzheimer’s. We login to the world – wide – web to ask our questions and get our answers using electronic devices. My mother logged in to the Universal Information Field (UIF) to ask her questions and get answers without any electronic device. So what is going on? When people are in the late-stages of Alzheimer’s their cognitive functions have severely declined and their brain activity, such as it is, has slowed down. Once this happens they start to have intermittent altered states of consciousness. In these altered states their perception is different from ours and they are aware of things outside our normal range. They can, for example, like my mother, demonstrate extra sensory perception (ESP) such as logging in to the Field without the aid of an electronic device. Where does this awareness and ESP come from when the brain has all but been destroyed? I am suggesting that it comes from the mind, not the brain. Rupert Sheldrake, Lynne McTaggart and others hypothesise that the mind accesses information from the Universal Information Field. The mind downloads information from the field to the brain where it is processed. In late-stage Alzheimer’s however, because of brain damage, the person’s faculty of speech is often lost making it impossible for them to tell us what they they are experiencing. Fortunately my mother retained some speech so she was able to tell me the questions she had asked and the answers she got when she logged in to the Universal Information Field. What might our role be in this? First we can be aware that at this late stage our loved ones will have intermittent altered states of consciousness in which they may experience things outside our normal range. Knowing this we can acknowledge and validate their experiences – after all they are real to them. If they can talk we can listen with curiosity – we might learn something. If they cannot talk we can be aware of gestures, such as reaching out towards something that is invisible to us, that might indicate they are in an altered state and experiencing something extraordinary. Finally we can thank our loved ones for bring information from the Field to us and teaching us. We can gain access to the Universal Information Field and ask our questions without an electronic device or having Alzheimer’s. Dowsing is one way of doing this. When we dowse we ‘park’ the thinking part of our brain and use our mind to access the Field to ask our questions. In Alzheimer’s this is involuntary because the brain in not functioning normally but we are in a position to exercise choice. So I suggest, rather than accessing the internet to ask all our questions, we do what our loved ones do: slow down, stop and become quiet inside and totally present. This will take us into an altered state in which we can use our innate gift, our mind, to login to the Universal Information Field and ask our questions. The question then is, what are we going to ask? Join me again to continue our exploration of states of consciousness, the Universal Information Field and other mysteries. Having written a new chapter, A Positive Way Forward, for my book I was surprised at the conclusion I came to. After weeks of work that culminated in 25 pages and 5,000 words, as I was writing the conclusions and had an aha moment. A Positive Way Forward is a practical guide that brings knowledge and understanding about Alzheimer’s to families, carers, health care professionals and educators. It covers a wide range of subjects and draws on my personal experience, recent research in neuroscience, information from medical and non-medical sources and Alzheimer’s organisations. Here is a quick preview of the subjects covered which I hope you will find interesting. The Brain: Repetition, fixating, oblivious to errors, misperception of time, misperception of age and intermittent disruption. Conclusion – so what was my conclusion? We can help them do this in a number of ways: by ensuring they feel safe and are well cared for, by being fully present and loving with them, by being emotionally engaged with them, by providing opportunities for creative expression though which they can express their emotions. These things not only enhance their lives but they enhance ours lives too. So this is not only A Positive Way Forward for people with Alzheimer’s, it is a positive way forward for us. But in order for us to move forward we probably need to change. We need to become more present, more emotionally honest, and more direct in our communication with others. In truth, we need to be more like our loved ones. But how aware are we? How aware are we? The focus in the UK this month has been on awareness of the vulnerable members of our society who are at or nearing the end-of-life. Events included: Alzheimer’s Awareness Month, Dying Matters Awareness Week and Dementia Awareness Week. But how aware are we? And what does awareness mean? Can we sustain or even increase our awareness? After the fan-fair of this month is over are we going to unconsciously slip back into a state of lesser awareness? I am now going to ask a number of questions to focus our attention on this. To be aware implies having knowledge gained through one’s own perceptions or by means of information. Some synonyms are: cognizant, conscious, awake, watchful, vigilant etc. Let us now apply some of these to the context of Alzheimer’s. What have we gained as a result of the focus on awareness this month? What have others gained as a result of the focus on awareness this month? What information have we acquired that we didn’t have before? What have we seen that we hadn’t seen before? What have we heard that we hadn’t heard before? What have we felt that we hadn’t felt before? In what way has this new information and have these new experiences changed how we perceive people with Alzheimer’s? In what way has this changed how we feel when we are with someone with Alzheimer’s? What are we going to do differently as a result? How are we going to do things differently as a result? So far my questions have been directed at us, people who do not have Alzheimer’s. What about people who have Alzheimer’s? What about their awareness? It is easy to assume when someone can’t remember what he or she has just said that they are unaware. However nothing could be further from the truth. It might surprise you to learn that when people have Alzheimer’s they become more aware in some respects than they were before the onset of the disease. Neuroscientsts have discovered that as cognitive skills decline, the capacity for empathy increases. That means people with Alzheimer’s become very sensitive to nuances in the facial expressions, voice tones, gestures etc. of others. They may even be more aware of subtle changes that are occurring in us than we are ourselves. Not only that, research has shown that their capacity for empathy and their awareness increase as the disease progresses. Furthermore they respond instantly to changes they notice in us and reflect them straight back to us. This is called ’emotional contagion’. Knowing these facts places a responsibility on us to be more aware of what we are feeling and how we are expressing ourselves, verbally and non-verbally. In the context of Alzheimer’s, awareness is a two-way process in which a symbiotic relationship develops, the outcome of which is determined primarily by us. By bringing awareness to this process we can choose to let go of any negative feelings we have from the past and use this as an opportunity to engage in a positive way to generate new, more loving relationships. When we do this we discover deep, unconditional love that often had not been possible before the onset of the disease. Although I have focused on awareness in relation to Alzheimer’s, the same principles can apply to relationships with people at the end-of-life. So let us engage with people with Alzheimer’s and others with conscious awareness, embrace the loving connections that they bring and appreciate the precious gifts that are there for us and in particular, The Gift of Alzheimer’s. Are you afraid of dying? If you are afraid of dying you are afraid of really living. Most people are afraid of dying yet people with late-stage Alzheimer’s are not, at least the ones I have encountered. What is the difference? You might assume it is because, having suffered for many years from a protracted terminal illness, which Alzheimer’s is, people just want to die to get away from it all. I believe there is a much more interesting explanation. People with late-stage Alzheimer’s, and people at the end-of-life, often have intermittent altered states of consciousness in which they experience another world with a different reality. In this other world there is no fear or pain and they are at peace. My mother said, “I am at peace, I have no worries, no fears. I am in no pain.” In this world she was very disabled, both mentally and physically. She had also spent a lifetime suffering from depression and worrying. So this other world was a new and welcome one and a blessing for her. One day when I looked worried she said to me, “We’re learning we’re immortal.” On another occasion she told me of a dream she had had in which she had a preview of her own death. She said, “Death is nothing to be afraid of. It is peaceful”. This was reassuring to her and I might add it was deeply comforting to me. Over a period of three and a half years she frequently sojourned into another world and when there, to my astonishment, expressed the wisdom of sages and spiritual teachers throughout the ages. All this was delivered in a voice of absolute authority. It is understandable, when we don’t have these other world experiences ourselves, we dismiss them as delusions and see only the suffering in this, our physical world. But if we acknowledge the other world the person with Alzheimer’s is experiencing, he or she will feel validated. Not only that, slipping into the other world is a natural preparation for the next stage and a for a good ending in this world. If we view these experiences in this way and value them we can learn from them. Fundamentally there are two emotions, love and fear. Where there is fear there is no love and where there is love there is no fear. So maybe the key to being unafraid of dying is to love. And if we really love we can really live. Have you heard anyone saying something positive about Alzheimer’s? Probably not, unless you have been following my lone voice. Why? Is it a bad experience for everyone? Is it bad all the time? The answer is no. So why does almost everyone talk only about the negative aspects? I am writing this to encourage people to ‘come out’ about their positive experiences and share these with others. By doing this we can start to change the perception of Alzheimer’s from being totally negative to being positive, even wonderful at times. Speaking out will help to reduce the widespread fear and dread surrounding this disease. I acknowledge that Alzheimer’s is not positive for everyone, sufferer or carer, and that it can be extremely difficult for those involved. Nor is it positive all the time, particularly in the early stages. But I believe that there is a window of opportunity in late-stage Alzheimer’s to have very positive experiences. A note about diagnosis: Alzheimer’s is the most common form of dementia but there are over a hundred forms of dementia and each presents in a different way. With this complexity I believe some people are misdiagnosed. This leads to a confusing picture of the behaviour of the people who are diagnosed with Alzheimer’s. In frontal lobe dementia for example, emotional behaviour is very differently from that exhibited by people with Alzheimer’s. It was only when my mother had late-stage Alzheimer’s to my surprise, in the midst of confusion and mental and physical limitations, she became very loving and had moments of great clarity and lucidity. I have written about the scientific basis for this in my previous blog. So inspired I was by what she was saying I recorded our conversations and published these in my book, The Gift of Alzheimer’s. The need to post this blog has arisen out of a number of conversations I have had recently with people who have had experience of being with someone with Alzheimer’s. When they ask me what I do I explain that I write and talk about the potential there is in people with late-stage Alzheimer’s and the positive experiences my mother and I had. On hearing this almost everyone, without exception, has come out of the woodwork and started telling me their stories and positive experiences. I was talking to recently to a senior medical consultant and when I told him about the journey with my mother his face lit up and he told me that he had had a very similar one. He looked relieved at discovering this common ground between us and I got the impression he had not shared his experiences with anyone else. It was as if he had not fully acknowledged what was happening as it did not fit the standard model – the model of Alzheimer’s being totally negative. This was an ‘aha’ moment for him and a gift to him and his mother. How many people are like this consultant? How many people have not dared to speak out in our culture of overwhelming negativity? When the opportunity arises, let’s talk to others about the potential, the unspoken possibilities that are just waiting to be enjoyed, cherished and shared. Let’s ‘Come out’ about the gift of Alzheimer’s. “Love is what it is,” my Mum told me when she had Alzheimer’s. But what did she mean by this simple yet profound statement? And what were the conditions that gave rise to her realisation? It is only a few days since Valentines Day but already the red roses and many symbols of romantic love have gone, disappeared from view. So what kind of love is the love my Mum was talking about? Many people with Alzheimer’s have the capacity to give and receive my Mum’s kind of love and surprisingly this happens when major functions, such as short-term memory and vocabulary, have significantly decreased. So what is happening? Neuroscientists may be able to shed some light on this. Professor Oliver Turnbull at The Centre for Cognitive Neuroscience, Bangor University, UK, has researched emotional-based learning in Alzheimer’s. He found that emotional memory continues independently, even when other kinds of memory are decreasing. Researchers at the University of California, San Francisco, (UCSF) Memory and Ageing Centre analysed the functional MRA scans of people with Alzheimer’s. They found that as the part of the brain that is involved in cognitive processing decreases in activity, another part of the brain, the one that processes feelings of empathy, becomes more active. As a result, people with Alzheimer’s become very sensitive to nuances of facial expressions, tone of voice, gestures etc. Not only that, they mimic what they are seeing, hearing and feeling. This is called, ‘emotional contagion’. Further more, the same researchers found that as the disease progresses, feelings of empathy actually increase. These findings have huge implications for all those involved with people with Alzheimer’s. If for example a carer feels love, the person with Alzheimer’s will sense this, feel it too, and express it. But because of their high level of sensitivity they will reflect what the carer is feeling, be that love or some other emotion. It is important to acknowledge too that although many Alzheimer’s suffers respond to love with love, there are those who don’t and continue to be aggressive towards their carers, despite being shown genuine loving care. It is not fully understood why this happens but it may be that they are suffering not from Alzheimer’s, the most common form of dementia, but from another kind of dementia that is affecting a different part of their brain. There are over 100 different kinds of dementia and it could be argued that there are as many kinds as there are sufferers as everyone has an individual pattern of neurological degeneration. There are other factors at work in late-stage Alzheimer’s that I believe contribute to the expression of love. The part of the brain that filters and moderates thoughts and feelings for the outside world ceases to function properly. When this happens people with Alzheimer’s say exactly what they are thinking and feeling. This lack of inhibition can be quite disconcerting and can result in the expression of negative as well as positive thoughts. But if love is being expressed then it should be embraced wholeheartedly without embarrassment. Mutual feelings of love can lead to a beautiful symbiotic relationship. Another factor that I believe is involved is the slowing down of brain activity which results in the person focusing only on what is happening in the moment, without the distraction of thoughts from the past or thoughts about the future. Being totally in the ‘now’ means attention is focused on what ever is present. If this is love, then love is all there is. Is not exclusive. It is inclusive and universal. It is not transitory. It is lasting, enduring and eternal. It is not something. It is everything. “Love is what it is.” Mum. Since posting my last blog in December we have transitioned from the old to the New Year. Did you stop and reflect on the passing year and contemplate the year ahead, or did you mindlessly party your way through it? Maybe you did both. You might be wondering how this relates to Alzheimer’s. Well, if we change the time frame from a year to a lifetime, and the context from our lives now to late-stage Alzheimer’s and the end-of-life, it is very relevant indeed. And looking at these contexts raises some important questions for us in our lives now. When people have late-stage Alzheimer’s, or are nearing the end-of-life, the mental structures that have held everything in place loosen and start to fall away. Unresolved issues from the past come to the surface, involuntarily. Jung called this, “the personal unconscious in which forgotten or repressed material surfaces in a state of diminished consciousness”. These memories were repressed because they were too difficult to deal with at the time, so it is not surprising that when they eventually surface they are distressing. They can present as a single episode or a number of episodes that span a lifetime, sometimes called a ‘life review’. If we as carers and friends ignore or dismiss troubled thoughts as merely the wandering of the mind, the person is left with unresolved negative feelings about themselves and without the resources to process them. But if we are aware of what is happening we can listen, ask questions sensitively and support them. We can go even further and assist them in resolving the things that are troubling them. A helpful position to take is to tell them that, although in retrospect they might see things differently now, we all make the best choices at the time, no matter how strange that might seem. If this had not been the case we would have done things differently. Reviewing the past in this non-judgemental way can bring about new understanding and result in deep healing. I call this, emotional clearing and healing. By listening and supporting a loved one in this way we can help him or her to find comfort and peace of mind. It heals the past and enables the person to move forward with positive feelings. However, it would be easy to work though this process once and think it is finished, complete. Not so. If you are listening you are likely to hear these cries for help many times, so keep going. The more emotional clearing and healing that can be done, the less baggage the person has to carry with them and the easier it is for them to face the end-of-life, free from fear and with a feeling of peace. And now it is time for us to face some important questions about ourselves. Are you carrying unwanted baggage? What are you doing about it? Emotional clearing and healing our past now is preferable to leaving it till we don’t have the resources to manage it and are totally dependant on others. Have you thought about what you would want at the end of your life and what a good ending might be for you? If you haven’t it might be an idea to do so now, what ever your age. Thinking about what we want at the end-of-life can help us to discover what we need now in order to be happier and more fulfilled. After all, who would not want to be free from fear and be at peace? So, out with the old and in with the new, with conscious awareness. Wishing you happiness and fulfilment in 2014 and looking forward to the next stage of our journey.